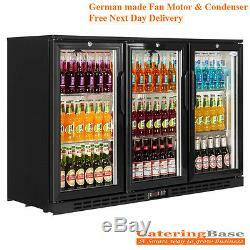 Interlevin 3 Hinged Door Back Bar Cooler. Dimension : 1350W x 520D x 900H mm. Same day dispatch on orders before 1pm Mon-Fri. Dimension 1350W x 520D x 900Hmm. 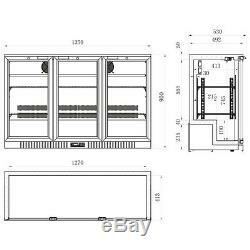 Internal dimension: 1270W x 413D x 745H mm. Ideal for pubs and restaurants. German made EBM fan motor as well as condensers that are less liable to blocking. 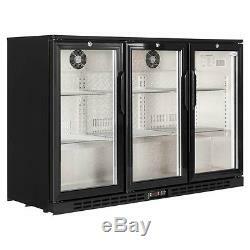 Budget double door cooler, nothing fancy but it has the build quality and reliability to get the job done at a low price without compromising on quality of parts used in the unit. Digital controller and temperature display. LED Internal light with switch. Black finish hammered aluminium interior. The Goods are supplied at competitive prices and thus (dependent upon the price), the Goods are supplied with. 2 man crew, pavement drop between 8am and 6pm. There will be no a book in call and someone must be at site to receive goods. The majority of our deliveries are made on 18 Ton vehicles (these are around 4m/13ft high and 11m/36ft long approximately the size of a double-decker bus). 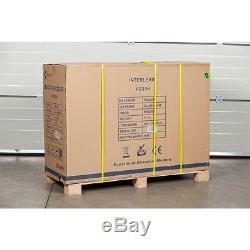 We always endeavour to deliver the item ordered in as quick a time as possible. They generally manage to keep their promises on such things, but we are always in their hands once the goods have left our warehouse. In the rare event that a delay occurs in your item being delivered, all the companies we deal with have specific procedures and timescales for investigating lost or delayed parcels. We CANNOT short circuit that procedure and unfortunately you will have to abide by their terms. When you place an order with us, you accept these conditions as part of your contract. It does not include negotiating lifts or stairs. This is customer responsibility to check that products ordered will fit through doorways and into their premises. We cannot accept responsibility if it will not fit. The item must be in original package and unused condition. The customer will in the event of agree cancellation indemnify the Company in full against all expense and loss incurred up to the time of cancellation in accordance with the following formula namely. The customer cancels after the Goods have left the Company's warehouse but before they have been unpacked by the customer a charge of Twenty percent (20%) of the invoice value will be charged plus any carriage charges incurred by the Company at the time of cancellation. If the customer cancels after the Goods have left the Company's warehouse and the goods they have been unpacked by the customer a charge of Twenty Five percent (25%) of the invoice value will be charged plus any downgrading amount necessary together with any carriage charges incurred. The company was founded in 2007 by Michael Chan C.
Msc, CateringBase Ltd is known for its service excellence, leadership and healthy balance sheet. Our mission is to provide affordable prices and quality equipment to our customers. We constantly review our products and services to ensure our customer always gets the best deal in the marketplace. Our vision is to be a leading catering equipment distributor in the United Kingdom. Providing a simple and efficient service to the customers. Innovative and introduce new products and services. Invested in staff and new computer system. The growth in the company is so visible and we moved into our new office building on 01 February 2009. The new office is equipped to a better specification, allowing us to increase our productivity and provide high standards and levels of service to our customer. We have invested in a new website and staff to ensure we keep up-to-date with today's fast moving industry. Quality Product with Reasonable Price. If you cannot find what you are looking for in the website, please give our friendly sales team a call on 0121 386 6628 and they will do their utmost to help you. Our price match promise means that in the unlikely event that you find the same equipment at a cheaper price we will match it gladly. We're here to help whenever you need us. High quality products at amazing prices. You won't find cheaper prices anywhere! All stock held and dispatched from UK. We're a uk based company specialising in Catering equipment and much more. The item "PD30H HINGED UNDERCOUNTER PUB RESTAURANT 3 DOOR BAR BEER BOTTLE COOLER FRIDGE" is in sale since Friday, July 28, 2017. This item is in the category "Business, Office & Industrial\Restaurant & Catering\Bar/ Drinks Equipment\Soft Drinks Equipment".